For as long as I can remember, I’ve always looked forward to Girl Scout Season for one simple reason: Thin Mints. Although they aren’t the most sophisticated of cookies, they remind me of my dad and his lifelong love affair with these crisp, chocolate bites of minty goodness. I remember him ordering huge quantities of cookies and shoving our freezer full of those green boxes. When we were kids, Jared and I much preferred the peanut butter sandwich cookies and could easily polish off an entire box in one afternoon. In fact, those Do-si-dos are one of the only ways that I am able to down milk without it being poured on cereal. As I grew older, my tastes sophisticated (hah!) and chocolate with mint has become one of my favorite ways to enjoy chocolate. So when my co-worker presented me his daughter’s Girl Scout order form, I took a cue from my dad and decided to stock pile some Thin Mints in hopes of using them as a base for a few desserts here on MBA. Yeah, I’m pretty certain that I bought more than I’ll actually incorporate into baked goods, but it’s pretty easy to write a check when it means support for a good cause. I’ve actually tried it hide the remaining cookies from myself, but that’s not working out so well… I can’t imagine why! This pie truly couldn’t be more simple. It’s a no bake recipe, which is always a bonus when a weekday craving hits. This Thin Mint Pie recipe starts out with a Thin Mint crust which is a seriously amazing foundation for a layer of cream cheese filling that is brimming with chopped Thin Mint Cookies. Top each slice with a dollop of whipped cream a few more cookie crumbs and you’ll be well on your way to enjoying a slice of minty bliss. 1. Place 24 Thin Mints into the bowl of a food processor and pulse until the cookies have been crushed into fine crumbs; mix with butter until well blended. 2. Press firmly onto bottom and up sides of 9-inch pie plate. Refrigerate crust while preparing filling. 3. Coursely chop the remaining (21) cookies; set aside. Beat cream cheese and sugar in medium bowl with electric mixer on medium speed until light and fluffy. Add chopped cookies and whipped topping; folding gently until well blended. Spoon into prepared crust. 4. Refrigerate at least 2 hours or until firm. Garnish with whipped topping and additional cookie crumbs. - Pie will store covered in the refrigerator for up to two days. - If you don't have access to Thin Mints, Mint or Plain Oreos can be substituted or Keebler makes their own version, called Grasshoppers. - Recipe adapted from Kraft. I definitely prefer thin mints frozen… i spend a good while gnawing on them. Weird habit, I know… but it’s so much fun. Oh my word… I could eat a whole one of these by myself. My goodness, this looks fantastic! As a former Girl Scout and cookie lover anything with thin mint is great with me! I wonder if I can track down any lingering girl scouts to snag a few boxes of Thin Mints so I can make this.. hmm..
1 little question though… what actually is a thin mint? Is it the same as a mint slice biscuit? We have them here in Australia, but I have never heard of thin mints? Thin Mints, Do-si-dos and Samoas are the top 3 for me. I don’t know why these cookies have such a hold over me, must be the anticipation of them only being available once a year. Great recipe and gorgeous photos!!!! I’m giving up or in or whatever, I am never going to lose anymore weight. I have decided to move next door to you and just be your chief sampler, and no, I am not a stalker, just a (dessert-loving) retired teacher. So email me your address and I will let my husband know we are moving,uh, is there a house in the neighborhood up for sale??? BTW That pie looks sinfully good! Oh. My. God. I’ve adored those thin mints my whole life and despite the sophisticasization (lol) of my own tastes I still love those things. My dad stockpiled them also! This pie looks awesome. MMmm! I love girl scout cookies and thin mints are of course, the tried and true classic. This recipe looks like a great variation on their flavors! Thank you! This is such a great idea. I too have always loved enjoying thin mints with my dad. This pie will make him swoon! Oh my word! What a great idea for a pie. Thin mints are one of my favorite Girl Scout cookies too. I love how this pie is no-bake! Amazing use of girl scout cookies, hehe. LOVE this pie! You are making me wish I had a stockpile of these cookies. Thin mints never last long enough in our house. Great no bake recipe!! Wow! these look delicious! cant wait to test out the recipe! my family LOVES thinmints! Thanks again for the outstanding recipes!! Oh my gosh this looks so good! Why did I give up chocolate for lent!?! YUM-MEE! 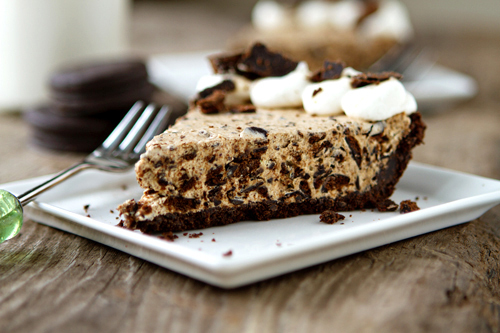 One of my very favorite flavor combinations is chocolate and mint (second to chocolate and raspberry), and this pie looks devilishly delicious!! Ahh this looks like heaven! Unfortunately I think I missed Girl Scout cookie season…Thin Mints were always my favorite too! Can’t wait to give this a spin with mint Oreos! Awesome use for thin mints! Looks delicious! What happened to your RSS feed? It used to have the whole blog post! Now I can’t read it at work! Any chance you might change it back? This cake looks delicious! I love thin mint cookies and any excuse to use them is great. Thanks for sharing! 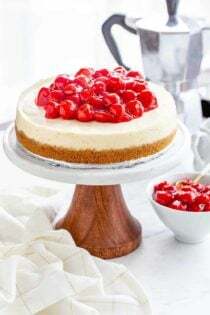 I love those simple no-bake cheesecake recipes. But this one looks like a cut above the rest. Beautiful!! This looks AMAZING! My husband does not like Chocolate paired with anything, except mint, so this will be a winner all the way around! I’ll be making this for our BBQ tonight. Also, girlie, you photo’s are FABULOUS! I dont know how you do it, but all of your pictures come out exquisite. Just wondering what the benefits are of leaving the cookies just roughly chopped in the pie, as opposed to finely crushed. Might have to try making this both ways. Also, if you don’t have Thin Mints, you can always use Grasshopper Cookies, they are the same thing and are available all year long! Oh my word!! Can I come play with you one weekend? That is to die for, I have to make this for my surfer.He adores thin mints. Would real whipping cream work just as well, or is the extra stabilizing stuff in cool whip needed? Looks delicious! Mint and chocolate are one of my all time favorite combos…and I just happen to have a few boxes of Thin Mints stashed away in my freezer. I make a Grasshopper pie similar to this, but I dye it green and use Keebler Grasshopper cookies. It’s a family favorite and I make it every year for Thanksgiving. I made this pie Sunday. I only had enough thin mints to put them in the ‘pie part’ so I used oreo cookies for the crust. This pie is amazing! My husband and I both love it. Thank you for the recipe! Love that you made these into a pie. Love it! Not sure how I missed this before, but oh my – delicious! You have absolutely no idea how happy you just made me. Anything that involves thin mints, cream cheese, AND coolwhip must be heavenly. As a Girl Scout leader we always have lots of Thin Mints around during cookie season. I have made Thin Mint brownies adding half a box of Thin Mints crushed up into a box brownie mix. Can’t wait to try this recipe!! 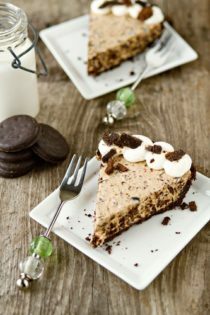 This looks delicious- we have a similar cookie pie, but instead of using girl scout thin mints for the crust, we use a butter cookie crust and then the topping is a layer of thin mint cream. Still, will have to try this recipe to compare- thanks for sharing!